Iran has unveiled its first surface-to-surface missile defense system capable of hitting targets with accuracy and “high precision”, the Iranian Defense Minister announced at a ceremony on Sunday, triggering a fearful reaction of neighboring Israel. The new system is called ‘Soumar’, and it has been manufactured by Iranian experts at a domestic aerospace industries organization affiliated with the country’s defense ministry, state-run IRNA news agency reported. According to the country’s Minister of Defense and Logistics Hossein Dehghan, who spoke at the presentation, Soumar stands out from the previous missiles in terms of its range, accuracy and precision. Among senior Iranian officials present at the test ceremony was the commander of the IRGC Aerospace Force Brigadier-General Amir Ali Hajizadeh. 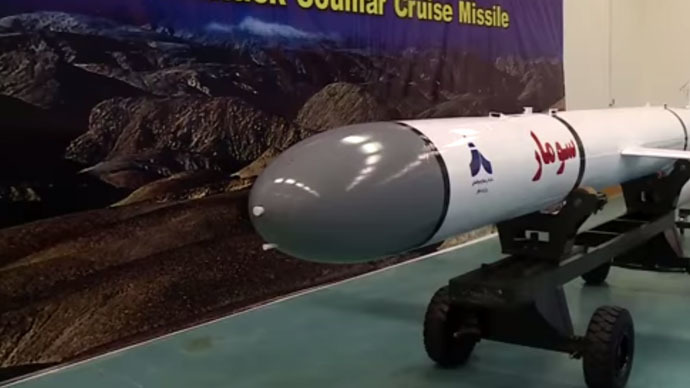 IRGC [the Army of the Guardians of the Islamic Revolution] Aerospace force also received the long-range cruise missile named ‘Ghadr’ and ‘Ghiam’. Minister Dehghan described the new missile as being capable of eliminating various targets and is equipped by radars that makes it precisely accurate, “despite radio electronic counter measures of a potential enemy,” according to TASS news agency. The minister added that the missiles help to increase the country's defense power, and that Iran does not need to get permission from others to develop defense capabilities, according to IRNA. Israeli media were alerted by the Iranian move, reporting that this was the first time such weapons had been unveiled publically with a probable lack of coordination with President Hassan Rouhani – and that it comes “on the eve of what could be a crucial round of negotiations toward an agreement limiting Iran’s nuclear program”, according to Haaretz newspaper. The report claimed that Iran purchased the Kh-55 from Ukraine back in 2001 and that before then, the missile was used back in the Soviet Union. In recent years, Iran has frequently announced tests of new advanced weaponry as the Islamic Republic is eager to strengthen its defense sector. Last week Iran reported about successfully test-firing a “new strategic weapon,” which the country said would play an important role in the future battle against the US. In January, Iran said it had activated its own “real Iron Dome” missile defense system, which makes the airspace above the Islamic Republic the safest in the Middle East. Before that, in November, Tehran presented its own copy of a US reconnaissance drone captured in 201. The Iranian Revolutionary Guard possesses an advanced arsenal of missiles capable of striking as far away as Israel and US military bases in the Middle East. Tehran also plans to increase the rates of production of drones (Unmanned Aerial Vehicles, UAVs), which the country’s Air Defense Force announced last month. The West blames the Iranian authorities for trying to develop nuclear-weapons capabilities, but Tehran insists that its program is for peaceful purposes. A framework agreement is expected to be reached in the coming weeks.